Medullosans are a group of seed plants that are commonly, albeit incorrectly, called seed ferns. Medullosans produce seeds, not spores, and are more closely related to conifers and flowering plants than to ferns. This misnomer arose because the leaves of Medullosans are very similar to and often mistaken for the leaves of ferns. 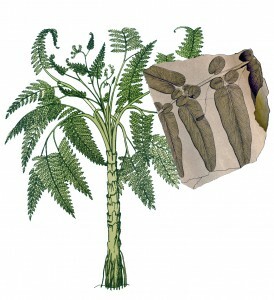 Medullosans lived all over the landscape during the Carboniferous and Permian periods. Some medullosans grew as trees, reaching about 33 feet (10 meters) tall, while others grew as vines, entwined around other plants. The tree-form is notable for having leaves that were up to 10 feet (3 meters) long. 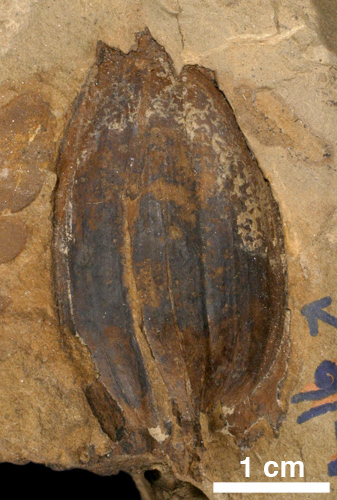 Medullosan seeds varied greatly in size from less than an inch to several inches in length, and the largest were among the biggest seeds recovered from the fossil record until the Cenozoic Era (over 150 million years later). 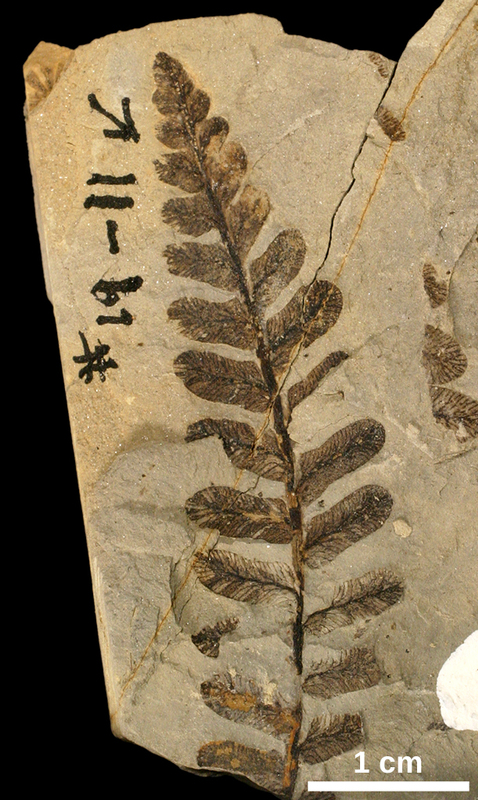 Neuropteris is one of several form-genera for isolated pinnules of Medullosans. 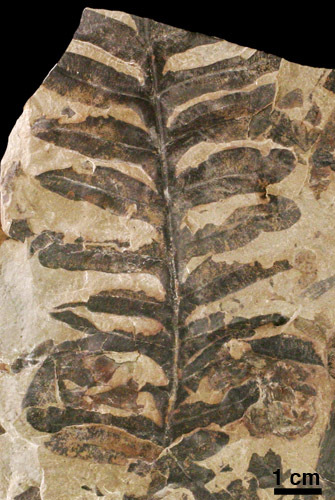 Neuropteris pinnules are characterized by cordate (heart-shaped) base and numerous, fine secondary veins arising from a primary (mid-) vein. The primary vein is usually well-developed and usually does not reach the tip of the pinnule. The secondary veins branch one or more times dichotomously (dividing into two) between the primary vein and the edge of the pinnule. 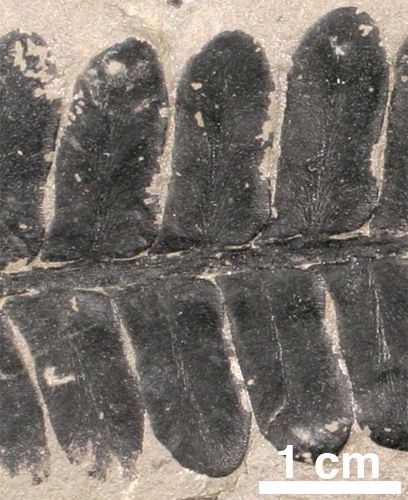 Each Neuropteris pinnule is separated from the axis/pinna by a short stalk. 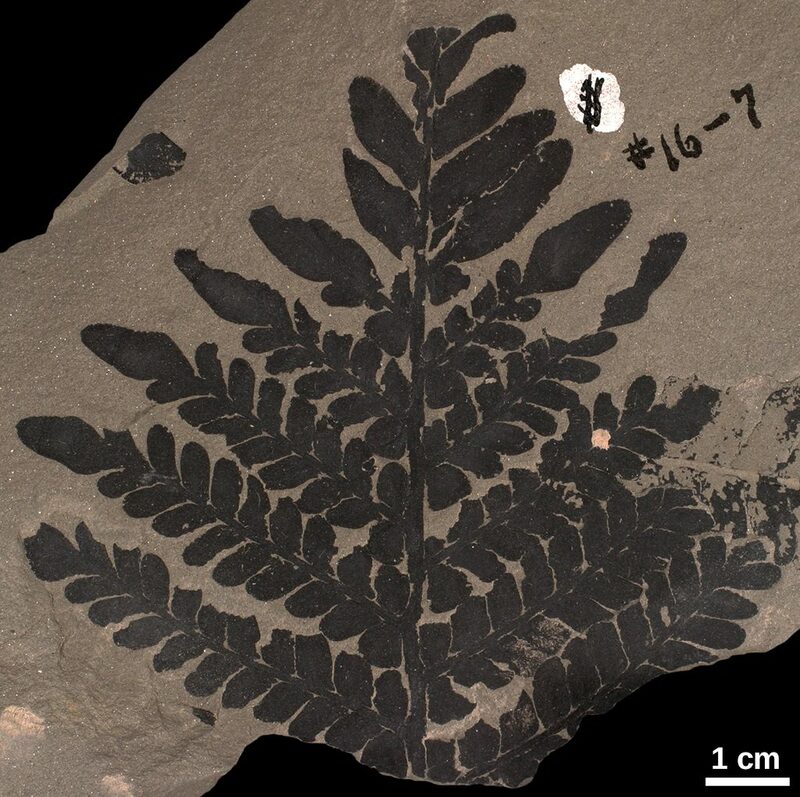 Neuropteris may be distinguished from Alethopteris and Pseudomariopteris by the stalks that separate the pinnules from the aixs/pinna, and from Sphenopteris by the absence of well developed lobes on pinnules well back from the tip of the axis (Neuropteris pinnules at the very tip of an axis show usually two lobes at their base). 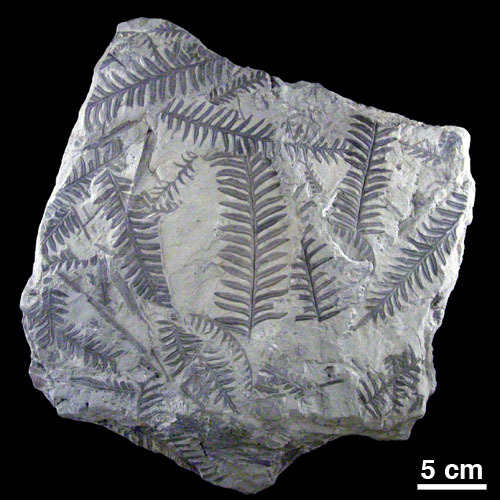 Neuropteris has recently be split into several separate form-genera reflecting (we hope) more appropriate biological species (e.g., Macroneuropteris). 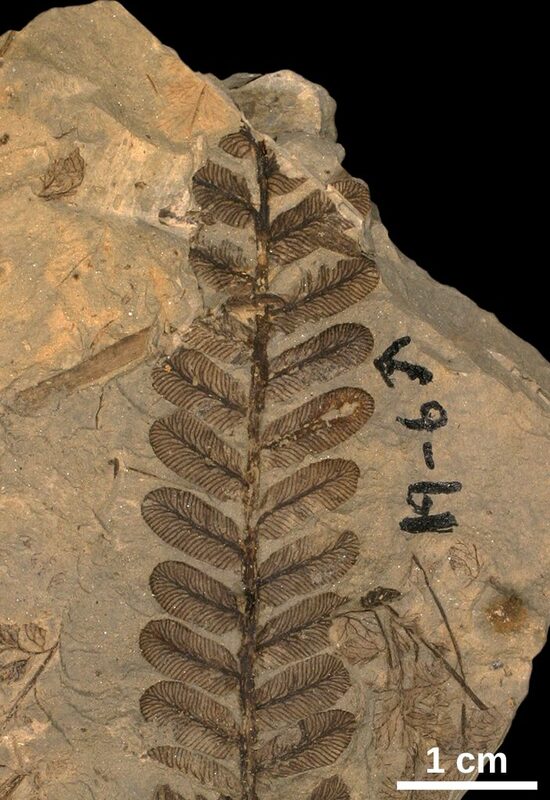 However, to assign Neuropteris to it current proper genus relies on characters of the leaf cuticle that are often not preserved and which require chemical treatment and compound microscopes to discern. 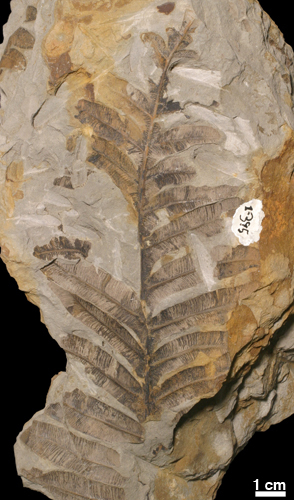 Neuropteris is therefore retained here for practical usage in field collections. Alethopteris is one of several form-genera for isolated pinnules of Medullosans. Alethopteris pinnules are characterized inclined pinnules broadly attached to an axis with the edges of each pinnule running into (confluent with) the next pinnule on either side. Alethopteris pinnules are characterized by numerous, closely spaced, strong secondary veins arising from a primary vein (midvein). The primary vein is well-developed and usually does not reach the tip of the pinnule. The secondary veins branch one or more times dichotomously (dividing into two) between the primary vein and the edge of the pinnule. 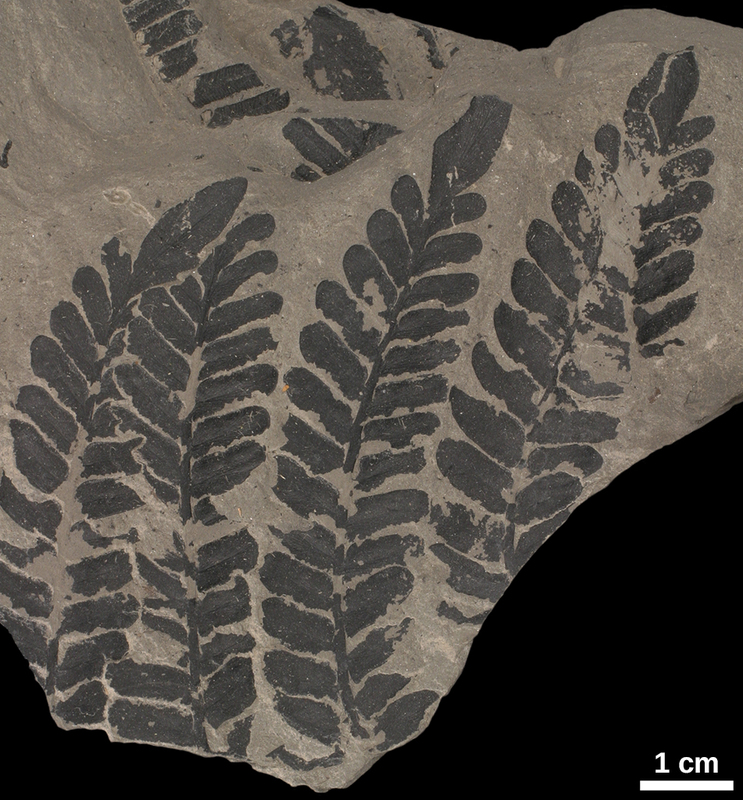 Additional secondary veins enter the pinnule directly from the axis Alethopteris may be distinguished from Neuropteris and Sphenopteris by the absence of a stalk for each pinnule. Alethopteris may be distinguished from Pseudomariopteris by its strong midvein and numerous, closely spaced secondary veins. 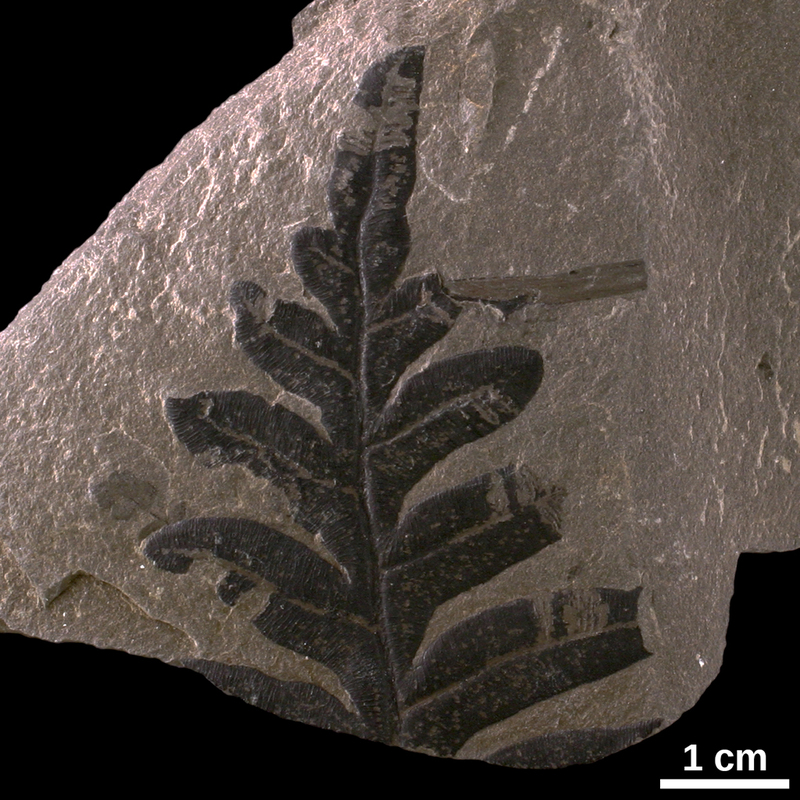 Alethopteris may be distinguished from the fern form-genus Pecopteris by confluent pinnules (although some Pecopteris do show this) inclined at an angle to the axis, with numerous, closely spaced, strong secondary veins. Trigonocarpus is a form-genus for one type of seed produced by Medullosans. It is one or the largest, and can reach about 4 inches (10 cm) in length. 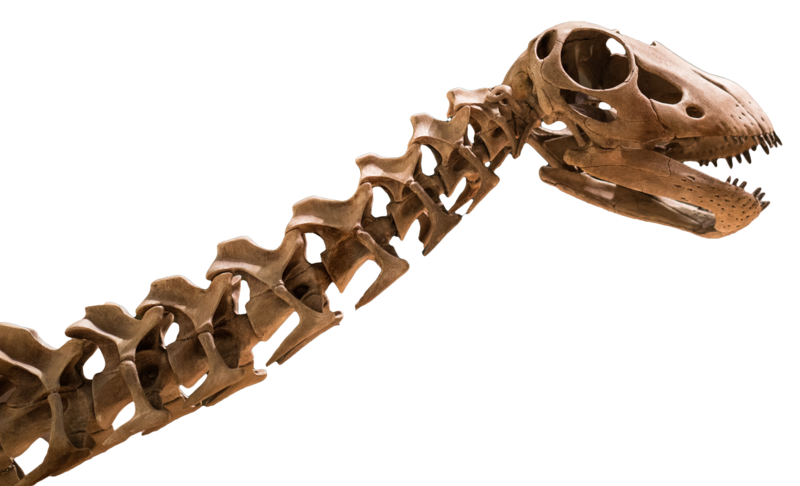 It may be recognized by its three prominent ridges that run along its length giving specimens an “over-inflated triangle” when viewed from the top or bottom.